Due to the installation of the upcoming exhibition "Francis Alÿs : La dépense", RAM will temporarily close from October 5th, 2018 to November 8th, 2018. 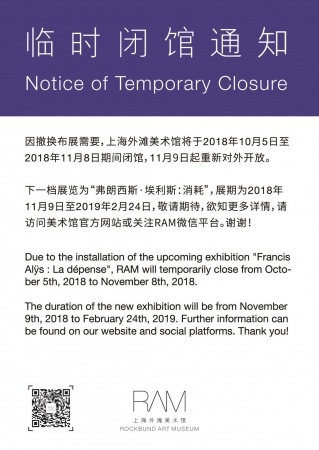 The duration of the new exhibition will be from November 9th, 2018 to February 24th, 2019. Further information can be found on our website and social platforms. Thank you!